I played a bunch of quickmatch matches last night for the first time in a few months. The XP changes for playing "needed" classes are welcome - I went support in every game and cleaned up XP-wise. Otherwise stuff felt mostly the same, with a game or two decided at hero select and mostly lopsided games otherwise. In one lovely game as Deckard on Sky Temple, we were ahead by a level when the enemy won a team fight, then took out Boss and followed it up by taking out both siege camps in the bottom lane right as temple objectives were appearing. The friendly team insisted on going for the TOP temple despite my pings for attention in the bottom lane. I ended up going bottom solo and getting run over as the enemy team pushed in force and took out the core before the friendly team had time to respond. Good times. Also, I wish Blizzard would ban out Cho-gall for quickmatch - he's just way too strong in good hands for the likes of a random-matched format. 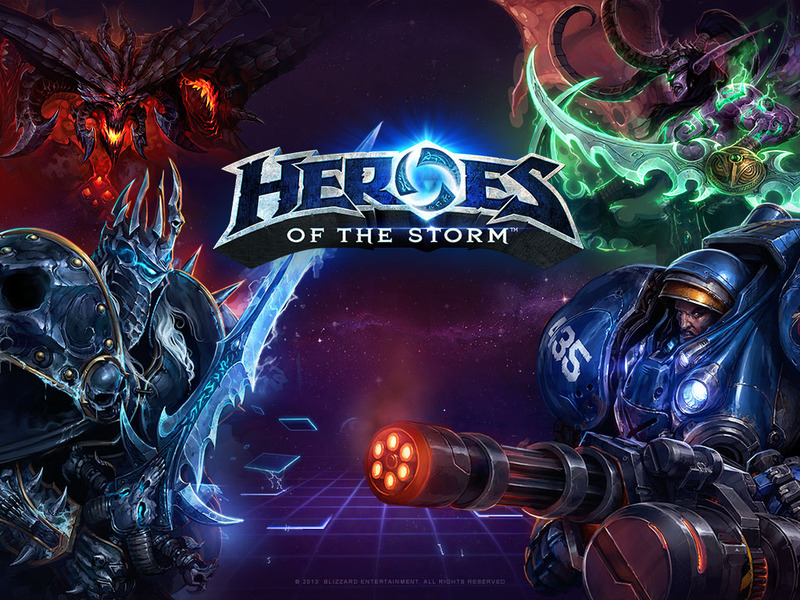 Blizzard president J. Allen Breck and chief development officer Ray Gresko said today that the company is shifting development resources away from Heroes of the Storm and putting those developers on other projects. “Over the past several years, the work of evaluating our development processes and making hard decisions has led to new games and other products that we’re proud of,” Blizzard said. “We now have more live games and unannounced projects than at any point in the company’s history. We’re also at a point where we need to take some of our talented developers and bring their skills to other projects. As a result, we’ve made the difficult decision to shift some developers from Heroes of the Storm to other teams, and we’re excited to see the passion, knowledge, and experience that they’ll bring to those projects. I'm sad I haven't had much time to play HotS these past few months... It doesn't sound like they're shutting the doors just yet. Still, I find it odd that they just released a new HotS-derived champ and announced/implemented other changes, only to make this announcement a few weeks later. I'm sad to read that. It's the blizzard game I play the most these days, but unfortunately the writing has been on the wall. It lags behind virtually every other meaningful esport and whether I like it or not that's the golden egg they've been chasing. MOBA 'fans' are a very demanding bunch, and they constantly require their game to be evolving and adding new stuff. I guess Blizzard just conceded it wasn't worth it any more. I'm very sad, I was really rooting for this game, but I hope the game sticks around for a few years anyway. It's been about two years since I've played this game but I am still sad that they are moonlighting it. I played it so much and got totally burned out because I was so competitive. That and the release of Overwatch. It was and still is my favorite MOBA. I was sad to hear this last night. I uninstalled it this morning. I feel like there's no sense in investing any more time into a game that is not effectively dead. It's sad because I really enjoy the game and not playing it is going to leave a multiplayer void in my gaming life. I don't play much, but Heroes of the Dorm was hands-down my favorite esport event and I'm sad to lose it. I have a Heroes podcast in my "people I like talking about stuff I'm interested in, but not so interested that I'll feel bad about falling asleep in the middle" bedtime rotation. From what I've picked up from that, the game has still been getting an insane amount of regular balance passes. Like, way more often than the typical MOBA. Even if things slow down I expect this will still be a successful niche game. The question is whether Blizzard will tolerate having a niche game on their launcher. They have a tendency to kill games that they don't think will be a home-run, but it remains to be seen what they'll do with an in-release game that's under-performing. It probably doesn't help that the eyeballs seem to have moved from MOBAs to Battle Royale games in the past couple years. I was sad to hear this last night. I uninstalled it this morning. I thought about doing that, but I thought it might be over-reacting a bit. Setting the game up for "long term sustainability" might just be CEO speak for "this game will be off our launcher within a year", but I'm hopeful I can still have a fun time while it's there. Try not to think of your time in-game as time invested, you're just having fun day to day. Edit: just to add, I've had this on my mind for most of the day, I'm really quite upset about it. I'm not a big multiplayer gamer, so I've never been 'in' a game that has been mothballed by its overlords. Now I know how all those Star Wars Galaxies players felt. I hope that I'm just over-reacting and it still has a reasonable player base a year or two from now. I’m having a hard time following this...if servers are up, people are playing, and you enjoy it to a degree where not playing it leaves a void in your life, why uninstall the game (you know, unless it’s one of those situations where a game’s got you so obsessed you’re making unhealthy life choices)? Enjoy the game!!! I certainly dont read this as the game closing down or being unsupported. I doubt Blizzard has fallen that far, yet. Probably just not a whole lot of new heroes, but I could se a few from time to time, like how a small team kept adding a little bit of stuff to Diablo 3, using previously developed content that had been left unfinished. Never really got into this game, though I played from time to time. MOBAs just seem to require so much effort to jump into casually or with long breaks. You kinda need to know what most of the heroes do, at least rudimentary. I'd agree with that Shadout, and I think that's why a lot of people stick with the first MOBA they play. For a lot of people that was Dota, unfortunately for Heroes. yeah, i saw the "long-term sustainability" blurb along with "the cadence will change". I'm really hoping this isn't the beginning of the end as HotS is where I get my MOBA fix these days after quitting LoL for good a few years ago. I wonder what it is about MOBAS these days. I loved LoL and liked HotS very much, yet I rarely play them anymore. I'm still an RTS fanatic, so I'm not sure what's happened. Maybe I burned out on them. They just require a certain amount of dedication in my view, and even if you enjoy them they can be mentally draining. And time. It's one thing to take 7-10 minutes uninterrupted to play a Rocket League match. It's another to set aside 25-50 minutes for a MOBA round. I've gravitated towards the shorter time investment. The time commitment is probably the biggest reason I quit LOL. HotS games typically max out around 20 minutes or less, which I think is perfect, but it was pretty rare for me to get through an entire LOL match in less than 30-40 minutes. That's just too long when games are of such variable quality. Agreed. That is/was the thing that kept me playing HotS. But a few months ago, I noticed my AI matches taking longer to queue up and further noticed more server disconnects and poor matchmaking, so those games started creeping up past 20 minutes. Though I've been really busy this past month, knowing how long the games were getting made it hard to get excited to hop on. After some time away I've started playing some Heroes again. The first thing that caught me out was Garden of Terror. I hadn't realised the map was changed and that you actually have to click and channel the seeds now. That caught me a little flame from my team because I was stood right on it without realising. Nevermind, I explained I was returning to the game and they were cool, but it made me wonder what else might have changed!? Hello folks. Any of yall planning on jumping back into HotS after the changes to ranked play/roles? I've been foolin' around with it off and on for quite sometime, but never stepped out of comp stomping and quick match. Thinking about throwing my hat in the ranked ring to see if I can have some fun. I'm still doing Quickmatch off and on but don't have plans for Ranked. Hopefully the new roles make for better experiences. Same here. Don't have the time/energy for ranked but I do like the look of the changes.